Columbus Square is a north east St. Louis neighborhood bound by Cole street to the south, Cass Avenue to the north, N. Tucker/13th Street to the west and N. Broadway/I-70 to the east. The 2000 Census counted 1,949 residents, a 17% decline from the 1990 count. 92% of Columbus Square residents are black, 6% white, 1% Hispanic/Latino. 1,236 housing units were counted of which 63% are occupied 7% by owners, 93% by renters. The 2010 Census counted 1,869 residents, just a 4% decrease. Pretty stable. Columbus Square was settled by successive waves of immigrants. The first wave, a group of German Catholics, settled in the vicinity of 11th and Biddle Streets. Later, the first Irish immigrants colonized the land around 6th and Biddle, an area that subsequently became St. Patrick’s parish. After 1840, the area from the river west to 12th Street was built up with high-density tenement quarters, row houses of two and three stories high, for the newly arriving immigrant laborers. Many of these structures fell before the wave of commercial and industrial development that began after the Civil War. Regardless, of those that remained, most had deteriorated into decrepit, overcrowded slums as early as 1870. These tenement communities tightly built around roads and alleyways became known for their poor living conditions and crime, with nicknames such as “Castle Thunder,” “Crabber Alley,” and “Wild Cat Chute.” An Italian community began to emerge near 7th and Carr Streets after the turn of the century. By 1920 the whole area north and west of downtown assumed a polyglot character of mixed nationalities, including immigrants from Russia and the Balkan countries. During the same period, in the portion that we now call Columbus Square, truck terminals and industries replaced many of these tenement homes. Housing staged a comeback in the area with the erection of the Neighborhood Gardens apartments in 1936 and Cochran Gardens public housing in 1952. 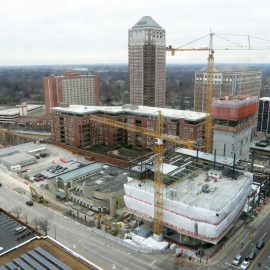 Later projects included the Columbus Square Townhomes and the Castles. Both projects were constructed between 1985-1987. With the renaissance of downtown St. Louis in full swing, the future of Columbus Square is brighter than ever. The restoration of the historic Shrine of St. Joseph has created a renewed awareness of the neighborhood’s centerpiece. 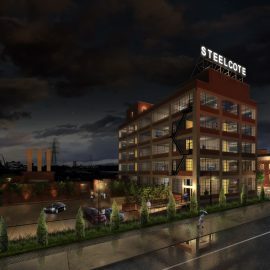 Additionally, as one of the most anticipated projects in the entire St. Louis region, the Bottle District is poised to redefine the future of Columbus Square. The big change that is coming soon is the opening of the new I-70 bridge over the Mississippi River. 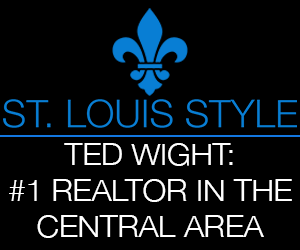 The landing in St. Louis will intersect with Cass Avenue and connect with Tucker, creating a new entrance to the north side of downtown. It’s likely this will spur quite a bit of development. Whether it’s commercial, retail, residential, or other we’ll have to wait and see. There’s no mention on the website of the transition of the polyglot character of the neighborhood to the now uni-culture that is nearly 100% African-American. It would be good to see some racially diverse neighborhoods in north St. Louis in years to come. Almost across the board, the current day stats indicate that the north city neighborhoods have very little to no racial diversity to speak of. Anyhow, this neighborhood is unique in that it’s current housing stock was almost entirely built up in the 1980’s. There are some older relics, but most of the apartments, condos and townhomes were built the last 30 or so years. It’s always strange to me that each of these developments need to be branded like it’s something special: the Castles, Courtyards at Cityside, Cambridge Heights….very strange. Is that supposed to evoke some kind of exclusivity? I don’t get it. An exception to the 1980’s buildings is Cochran Gardens, the last remaining 1950’s era federally funded public housing high rise. There are some excellent photos and background of this complex on the Preservation Research Office site, as well as Built St. Louis. Another of the older developments is the Neighborhood Gardens section built in 1935, a more human-scaled public housing development that has actually survived long enough to be re-purposed. It was built to last and thank goodness it has! Built St. Louis has more great photos. The other developments are vintage 1980’s stock. These are generally uninspired modern housing complexes, but they at least don’t have the typical suburban trappings of huge street setbacks, attached multi-car garages and large front lawns. Are these structures built to last? I guess only time will tell. Maybe I’m too short sighted, but I just don’t see these buildings ever being worthy of preservation through the historic registry. These kind of places seem like ones that get bulldozed every 40 or 50 years for something newer. Then again, perhaps they’re some of the most important developments for the city’s livelihood. After all, it’s not possible to fill every vacant space in the city with architectural gems. We need diverse housing and this seems to be working in Columbus Square. Regarding the business landscape in Columbus Square: there are very few businesses here that are not fast food joints (Domino’s, McDonalds, Chinese food). There was a Schnucks that served the area, but it closed in 2000. The abandoned Schnucks property has an ENORMOUS surface parking lot at 10th and Cass. I didn’t see any homeless on this property today and it was actually fairly clear of debris, etc; but, there is a homeless tent city on the rail road property between the Schnucks and the Cass National Bank and Trust. Cass National Bank and Trust operated from 1926-1970. 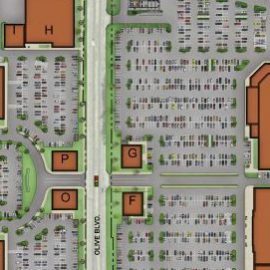 This area of Columbus Square is arguably the ugliest with the fast food joints along Tucker and the abandoned Schnucks property, I think this area could use some love. And hopefully the NorthSide development would be a major improvement over what is there today. 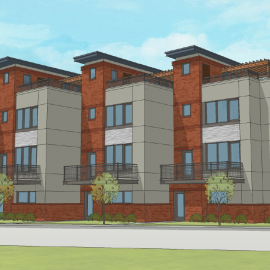 There had been a plan to renovate the McGuire Moving & Storage building into artist lofts, but the plan was undone when it proved to be impossible to secure financing for a residential project next to an Interstate highway. Cue City to River! 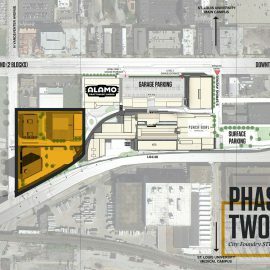 Part of Columbus Square is in the plans for the stalled/moth-balled/dead Bottle District entertainment development. Lots of big plans, huh? Sooner or later this area will see big development. The new bridge, proximity to downtown and the relatively clean slate are big bonuses for developers. They must be doing a pretty good job on the rat front, as I’ve only seen rats on a handful of occasions in my nearly 20 years living here. Frankly, this is not a neighborhood that overly inspires me, nor one I would take someone from out of town to showcase the city. I’m just not into 1980’s architecture. However, if you are interested in the history of public housing and government subsidized housing, check out Columbus Square. It has a long history of being home to slums and crime; but, it’s a long way from a slum today. Maybe Columbus Square will actually be a nice doorstep for north city and the site of more positivity and investment for the near north side in the coming years.